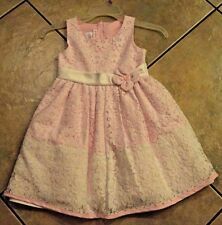 Girls size 2t Jessica Ann layed dress with embroidered eyelets and 3 sash rosets. Gathered bust with tye at the back and zipper. Beautiful dress for any occasion. NEW JESSICA ANN Girls dress, size 6. I would never intentionally misrepresent an item but since I am only human, things can get overlooked. We cannot solve what we are not aware of. Washed and worn once or twice, no signs of wear. Sweet Jessica Ann party/casual dress, 6, sleeveless, back zip,, lined, eyelet pattern in white up top, in green and purple checked lower layers. Fabric flower front waistband, sash ties in back. Shoulder to hem is 26 1/2, underarm to underarm is 12. Tulle Knee Length. Halter top. Orange florals. Size 4 Jessica Ann Floral. It can be worn with a nice sweater in fall or even winter season. Although she loves it because she was able to spin around in it due to having layers on it. 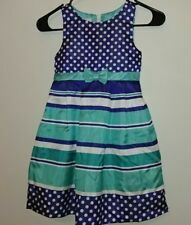 Jessica Ann Dress Girls Size 5 Blue With White Dots back zip 5 Flower Buds EUC Condition is Pre-owned. Shipped with USPS First Class Package. Excellent condition!! Jessica Ann Dress . By Jessica Ann. Nice for a wedding or Easter. It has the beautiful bubble hem. 24" shoulder to bottom. I love the material! NWT Jessica Ann Sz 6 Sparkly Bright Floral Easter Spring Dress Lined Halter Wow! 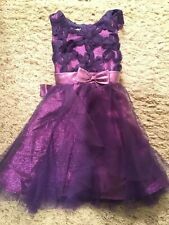 NWT Jessica Ann Sparkly Easter SpringDress. Adjustable halter neck/gathered back/side zipper. Bright spring floral accented with silver glitter! Very full twirl skirt/fully lined with gathered skirt & sheer pink peek-a-boo hem. Covered with silver sparkles - reflects the light. Very colorful - spring colors. Lined with 2" pink sheer attached to the bottom of lining. Pink sheer hangs 2" just below the dress. Machine Washable. Lining - 80% Polyester/20% Cotton This dress is in good condition. Would make a good Easter Dress. Care on reverse. If you are dissatisfied with your item or have any concerns. 100 Polyester. NWTSize 6Smoke- and pet-free home. Dress was worn only once and is in perfect princess condition. NWT shimmery purple dressSize 2TSmoke- and pet-free home.Thanks for looking, and please check out my other listings! 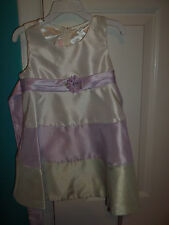 This is a Jessica Ann girls dress size 7. It is in very good condition with no holes or tears, with the exception of one dot of green on the left bow (as pictured). The zipper in the back works well and the bodice is lined. Jessica Ann Size 5 Floral Cotton Lined Halter Dress. Ruffles on underskirt. Elastic on back bodice. Bow on attached belt. Girls Easter Dress butterflies! No stains. Condition is Pre-owned. Shipped with USPS First Class Package. Super cute little dress. Mostly black and white with a pink grosgrain ribbon accent. Smocked in the back, ties in the back. Pink, green and blue butterflies near the bottom. Polyester, Cotton & Spandex. Beautiful dress has an ivory upper bodice with a scalloped ivory floral lace popover. Round neckline has an ivory satin bow sitting in a pink organza bow on right side. Jessica Ann pink and lime green polkadot dress size 7. Made in Sri Lanka. The dress is made of 100% cotton. It has somewhere but is in good to very good condition. The length of the dress from shoulder to bottom measures about 30 inches. The measurement from armpit to armpit is about 12 3/4. Thanks!! Zip up back. So very pretty! Beautiful Dress! Dress: 100% Cotton. Your Princess will LOVE it! Jessica AnnDress. Length: 26" from top of shoulder to bottom of dress. Armpit to armpit: 10.5" (21" around). White overlay looks like a cotton blend. Skirt has two layers under top skirt (see last picture). Dress is in excellent condition. Brownish color is a shadow. The actual color is pink like the rest of the dress. I take great pride in providing the online community with stylish, unique, and otherwise interesting goods. I scour all avenues to find the very best bargains so I can pass them on to you. Jessica Ann Girls size 6X Coral New with tags Comes from a smoke free home. Euc= excellent preowned condition. txzj pxzj15517 txzj5 txzj40. Girl Dress in White and Pink Size 6 by Jessica Ann. Condition is Pre-owned. with pink lining and pink roses and trim by Jessica Ann-Pre owned. Lovely size 6 Girls white eyelet dress. – Little Girls size 6 Pink white striped dress. Elegant little girls sleeveless dress. Nice pre-owned, worn once for Easter and photos. There is a light mark almost looks like a pencil mark near the bottom of the dress. JESSICA ANN DRESS RED BLACK PLAID SIZE 16 FREE SHIPPING!
" For God so loved the world, that he gave his only begotten Son, that whosoever believeth in him should not perish, but have everlasting life.". - John 3:16. I bought this adorable dress for my niece, but she had a growth spurt and only wore it once. You will love it! Jessica Ann Dress. This is just a disclosure. Machine Washable! 100% Cotton. Pet & Smoke Free.